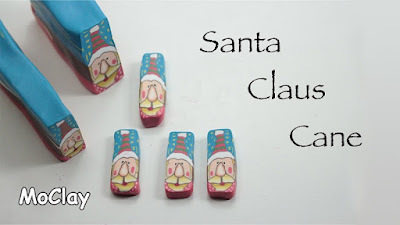 I thought this Mo Clay tutorial was just perfect for Christmas...perhaps not this year but next? It shows how this artistic and highly creative polymer clay artist sketched and colored a sweet depiction of Santa Claus from which she built up her milliefiori. Note that she starts at a particular feature and builds up from there. Canes like this can be used in jewelry, as buttons, decorations on candle holders and so on. Simple. I am using the term to describe the technique - not the literal translation. The Italian glass bead makers may have originally created flowers but the technique is the same whatever the motif.